I’ve never been big on brownies, much preferring a slice (or three) of chocolate cake instead. But sometimes being away from home makes you miss strange things, and for me, the other day, I wanted brownies. So today, you get 30 Minute Brownies from Scratch for What’s Cooking Wednesday. In the States, I never made brownies from scratch. Mixes were so easy to come by and also quick, easy, and delicious, so I never really saw the point for the one or two times a year I made brownies. But now, with no mixes in sight, I turned to a recipe my mom sent me (sent free to her from TimeLife) and gave it a whirl since I already had all the ingredients in the house — and you just might too! I changed the name from “Grandma’s Best Brownies” to “30 Minute Brownies from Scratch” since my grandma didn’t make brownies. No false advertising here! These brownies really do take 30 minutes *maximum* to make from start to finish, so that’s what I’m emphasizing; prepared mixes take just about the same amount of time and clean up will be about the same . . . so why not make them yourself from ingredients you know and love? 1. Preheat oven to 400°F and grease an 8 inch square baking pan (or as close to that measurement as you can get — I never did get one of those). 2. In large saucepan over low heat, melt chocolate and butter, stirring frequently. 3. Remove from heat and stir in sugar, then vanilla, and then eggs and flour until well blended. 4. Spread mixture in greased pan and place in oven. Let bake for 18-21 minutes until the brownies start to pull from the sides of the pan. 5. Let cool a bit before cutting. Stir in a bit of ground peperoncino for a spicy effect as I’ve done in my Chocolate & Peperoncino Mousse. Stir in a 1/4 cup of your favorite nuts (walnuts, almonds, pecans) for a special treat. I personally don’t like nuts in brownies, but I hold nothing against those who do. Cut the brownies a bit larger and use as a dessert with a scoop of ice cream and a drizzle of chocolate syrup…or even some melted Nutella. Whip up a quick chocolate frosting by beating together 4 tablespoons of butter and 1/4 teaspoon of vanilla. Then with a mixer on low, add in 2 1/4 cup of confectioner’s sugar and 1/2 cup of baking cocoa powder gradually, alternating with 3 to 4 tablespoons of milk. Beat well until the frosting is smooth and fluffy and then spread on brownies before cutting. 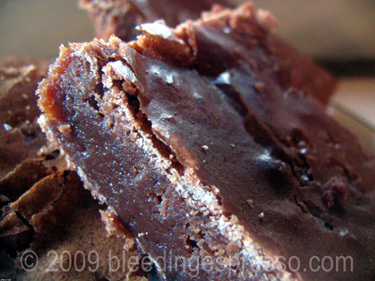 Do you have brownie recipes and/or tips to share? Sorry Michelle, I don’t. But your brownies look sooooooooooooo good. OMG now you’ve got me craving. I think I will go look for some chocolate in my kitchen! Hee hee…hope you found some! I love brownies with a cream cheese swirl or blonde brownies. Not a big fun of nuts in my brownies either. Sounds delicious! I think I’m heading to the local bakery after my blood test today. I just hope that he has some brownies (with nuts) left or I might have to suffer with a cheese danish! Poverino! Hope there are brownies! Great recipe. I’d increase the chocolate to 6 oz, though. After Lent, of course. Absolutely Fabulous looking brownies Michelle. Chocolate is sorta kinda outta my diet (lifestyle) now, but if I could eat it, this would be it! YUM! Now which of the six types of flour they have at my local should I be using – still can’t get use to ITalian flour types. I like the idea of specializatin but have the same problem with tomatoes – which ones for sauce, which for stuff tomatoe, which for salads etc etc. I never remember the 00 versus 0 or whatever, so I always get the one that says “per dolci” on it…that makes it easy 😉 The other one I only use for coating and frying seafood and the like. I assume the flour goes in after the eggs, right? And to answer Willym, I’ve found “American style” flour (Manitoba) at the Ipercoop. This recipe is very similiar to a recipe I found years ago on the back of a Baker’s Unsweetened Chocolate box. That recipe was called “One Bowl Brownies”, and this one is the same. I melted the chocolate and butter in the microwave, very slowly, stirring often. Yes Barb; I’ve edited, thanks! I don’t have a microwave, but if I did, I definitely would’ve melted in there…even quicker! How yum they look Michelle. I always make my brownies from scratch; no other choice. Yes 10 minutes work, 18 minutes to bake…& they are ready to roll. Love your recipe! YUM!! deeba’s last blog post..STRAWBERRY PANNA COTTA WITH A STRAWBERRY COULIS…the one that wouldn’t oblige! Exactly Deeba–10 minutes plus 18 or so…and YUM as the result! 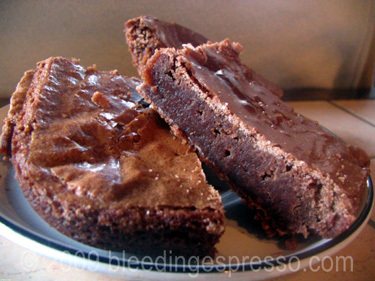 I may have to revisit my brownie position after these…really quick to make and very satisfying with coffee in the morning…hmm…. The mother of a friend of mine in college used to make brownies into which she would swirl caramel . . . to die for. I’m completely ANTI-NUTS in brownies. But sadly we don’t have an oven in our apartment, so now brownies for me anyway! But yours look fabulous! How do I get the butter into a tablespoon? (For those not sure: last comment was dry English humour, not a ‘dumb’ question..) but anyway, tell me how ya do it, dai..
OK fine, I’ll divulge my secrets. If you’re in the US (not sure about the UK), tablespoons are marked on the side of the sticks. FYI 8 tablespoons is half a cup in case it’s not marked. Mmm… the same thing has hit me a few times already. Strangely enough, always brownies! Thanks for the quick and easy recipe! I too do not like nuts in my brownies. This sounds like something I will need to try, thank you for posting it. aaaaaaaaah i want to eat these! why are you/they so far away?!? i might go get gelato at central market. i always complain to myself in my head when i see gelato in america, because you can’t take a gem out of its territory, it’s just not the same. it’s like good olive oil. if you leave the “terroir” it tastes different. but i have to sheepishly admit, the roasted almond gelato at central market is purty darn good! jessica’s last blog post..America Blogger? For the peporicino can regualr chilli be used? i seem to recall in like water for chocolate then it made everyone really horny, or was it chocolate with juliete binoche? There is something impossibly appealing about brownies. I would love one right about now with a cold glass of vanilla soy milk. Isn’t it funny how we crave the things from back home we probably didn’t even eat before? Your brownies look amazing! I just started making brownies a few months ago, using a Nigella recipe that calls for a whopping 6 eggs. Sooo decadent but worth it! And best of all, my mother-in-law is crazy for them!! That’s great about your MIL! Score! Linking to this from my Bachelor Recipe linkroll, lol. Nice and easy! Thank you! What a great idea for a recipe list! Oh my goodness — your brownies look so fudgy and delicious! I’m copying this for my brownie addict daughter! Thanks Michelle! Hope she enjoys them Pat! Those brownies look so good! I wish you’d post European measurements along with the US measurements. But when my 2 week restriction is up I know what I am making ! Where did you find vanilla extract btw? Or do you use the powder kind? I brought some vanilla extract back here the last time I was in the States; I’ve used the baking powder/vaniglia combo here in other recipes though.